Water Distribution Technician Brad Smith on the job Thursday morning on Central Avenue. Smith said he’s been with the city since 1987 and has enjoyed getting to know all the people in the city from the cab of a backhoe. After 30 years with the City of Delaware, Water Distribution Technician Brad Smith retired Friday. Smith said he came to Delaware in 1987 from Harrisville, Ohio, and began working for the city’s street department on Oct. 5, 1987. Smith said he worked with the street department for a few years before moving to the water department, where he worked for 25 years. Smith said he primarily operated a backhoe but did other tasks for the water department as well. 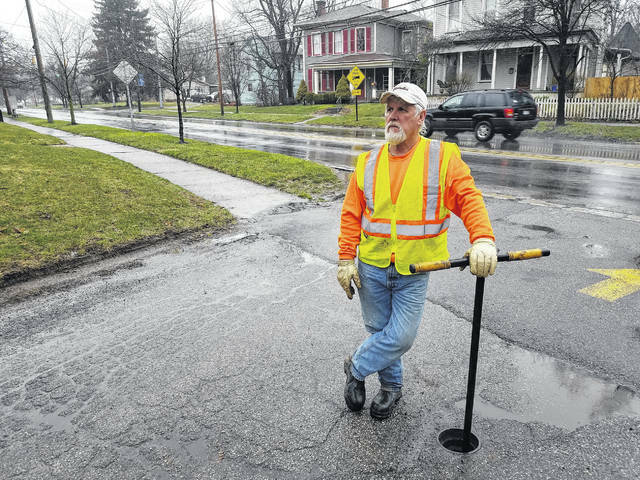 Smith laughed when reflecting on his last week after Monday’s 16-inch water main break on King Avenue and a truck getting wedged under the Central Avenue “can opener” bridge, less than a block from where Smith was working at the time. “It (was) a crazy week for the end of my time,” Smith laughed. According to Smith, the “wildest” thing he took part in was repairing a water main break in the Olentangy River near the William Street bridge. Smith said he’s made so many friends in the department and just by meeting people in the city on the job. Smith joked that the one thing he won’t miss is main breaks. As far as retirement plans go, Smith said he’s planning to ride his motorcycle, hunt more often, and spend time with his granddaughters. Blake Jordan, the city’s director of utilities, said Smith is an irreplaceable presence at the department. “It’s almost something you can’t replace,” Jordan said.